These two books are out of print items which have been scanned and made available electronically. 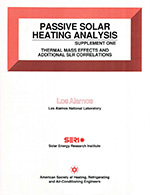 Supplement One to Passive Solar Heating Analysis provides additional solar load ratio (SLR) correlations and discusses how to analyze the effect of thermal storage in passive solar buildings. Solar heating analysis methods developed at the Los Alamos National Laboratory focus on small residential and commercial buildings. The book, Passive Solar Heating Analysis provides a simple, yet comprehensive, solar sizing and evaluation guide. Establishes 30 guidelines that range from general rules on solar area and orientation to passive solar system types. Zipped file of two out-of-print books, Passive Solar Heating Analysis, Supplement One (71 p.) and Passive Solar Heating Analysis (741 p.): 44MBFor best results, please use a high-speed internet connection for download.